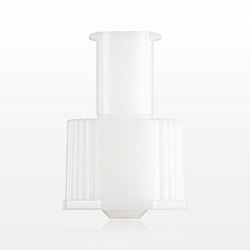 Qosina offers a wide variety of ENFit™ male and female connectors, caps, stepped adapters, Y connectors, stopcocks and syringes, as well as the ENFit to ENLock adapters, ENPlus cross spikes and universal bottle adapters for the ENPlus cross spike. All ENFit™ components are available for immediate delivery. Enteral is the first clinical application to make the transition to new, safer connectors. The New Enteral Feeding Connectors have been designed to improve patient safety and reduce the risk of enteral feeding misconnections. The new standard has changed the configuration of the male and female connectors. These enteral connectors are larger and will not allow connectivity with the male luer or female luer connectors that meet the ISO 594 standards or any other connectors for any other clinical use. Administration sets and syringes have a female connector end that fit into a male patient-access feeding tube port. The Global Enteral Device Suppliers Association (GEDSA.org) was formed to facilitate the transition to the new type of connectors and has created the brand ENFit to represent the new ISO 80369-3 standard. Qosina is actively researching the upcoming changes and is a member of GEDSA. Qosina will be adding compliant components to its extensive line as the standards become approved.